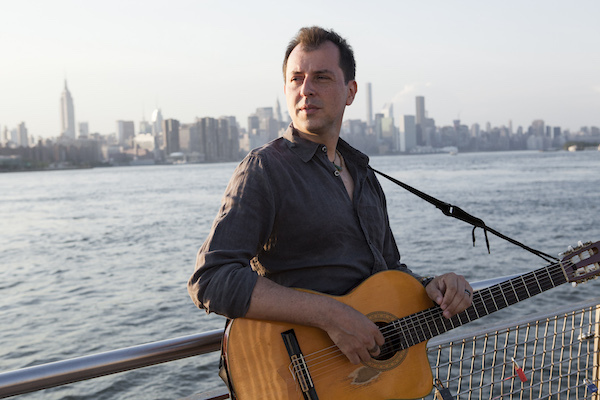 Venezuelan-Colombian and New York based singer-songwriter Juancho Herrera returns to Boston, a place he once called home, while attending the prestigious Berklee College of Music, to bring us his latest work “El Mismo Sol.” Herrera and his band will be taking the stage at Terraza 7 in Queens NY on May 7 2016. The content of his latest production was inspired by the nature of conflict within different contexts. From the political to the personal, from the turmoil of the Middle East to the streets of his native Venezuela, Herrera applies his stamp of South American “soul” to convey a deeply rooted conviction that only through dialog, acceptance and inclusion can these challenges be addressed. Humor, directness, and poetry inform the lyrics and the urbane, blues-infused sound is achieved through the familiarity created by the collaboration with long time partners Yayo Serka (Lila Downs) on drums, Bambam Rodriguez (Arturo O’Farrill) on bass. In contrast to previous releases by Herrera, “El Mismo Sol”, (produced by Herrera, Serka and Zwerin), has a “band” feel to it. Arranged as a group and recorded with minimal personnel, this new music reflects what the group sounds like in live performances. Strong, direct, soulful, and, sometimes raw, this new collection of songs never departs from the South American realm. Rhythms such as Venezuelan Merengue or Peruvian Festejo coexist with a heavier blues sound invoking a new character within these traditions. With this new release, Juancho Herrera and his band keep on delivering new perspectives into the World Music scene. Juancho Herrera Band at Terraza 7 on Saturday May 7th 2016, at 9:30 pm. No Replies to "Juancho Herrera Band"